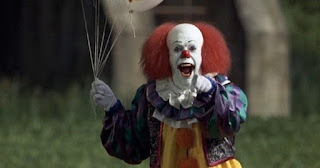 What in God's name is going on over there in North and South Carolina -- something about reported sightings of really creepy clowns just lurking around in the middle of the night in odd places? Even seemingly enticing kids into wooded areas? Seriously.... It's been on the news. And even freakier is the fact that it seems to only be happening right in these two states. Could It Be Connected to the Whole Rob Zombie "31" Thing? That was a thought crossing many minds. But the fact is this: Distributor of the film Saban Films stated very openly that they're in no way associated with the "creepy clowns and costumed characters found roaming the South." So bummer. Mystery still hasn't been solved. OH! What about that new IT remake coming about by Andy Muschietti? Unlikely as well given the fact that the iconic novel's set right in Bangor, Maine, and not in either Carolina state, plus we're only a year away from the release of the film. That's a long shot that this whole scary clown movement going on there is a publicity stunt for the upcoming film. We rarely get to see that real-time horror happening, but it is. Luckily, as far as I know, no clown has captured a kid, nor eaten one, or anything disgusting like that. Let's hope it never happens, because as much as we love horror, we certainly don't want it emulated in real life.